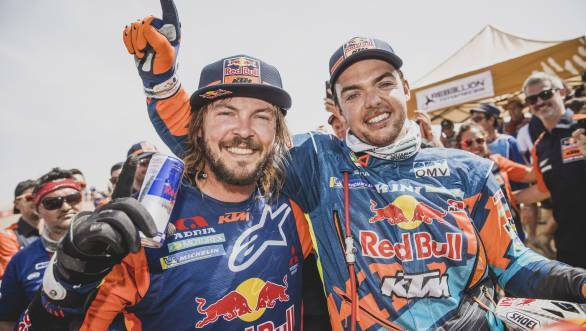 The 2019 Dakar has seen some superhuman efforts from various competitors, perhaps none as heroic as the ride Toby Price made over the course of 10 stages. 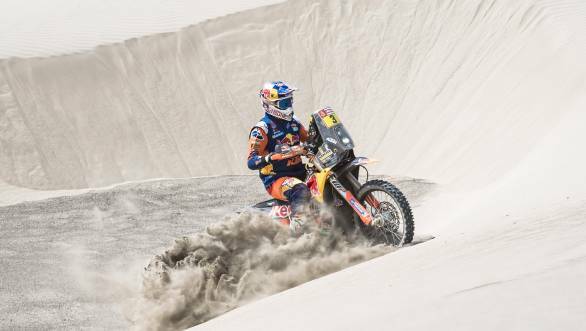 Riding despite the fact that his scaphoid bone was injured, Price managed to top the final stage of the event and claimed his second Dakar victory, having won the event back in 2016. His victory also marked KTM's 18th consecutive Dakar win. The Moto class of the event, like the Car class, saw some major upsets over the course of the rally. Early leader Joan Barreda Bort ended up retiring from the Dakar on the third day, making it his third retirement in four years. His Honda Racing teammate Ricky Brabec led the rally soon after, before an engine failure on the eighth stage forced him out. Yamaha rider Adrien Van Beveren also retired from the rally with an engine failure. Eventually, in the closing stages, it became apparent that the battle for victory in the Moto class was between Price, his KTM teammate and defending Dakar champion, Matthias Walkner, and Pablo Quintanilla of Husqvarna. When Quintanilla crashed early on during stage 10, it seemed like the battle was between Walkner and Price, with Price ultimately winning the 10th stage. Walkner settled for second overall, while Quintanilla took third place. Laia Sanz finished the rally in 11th place overall, her second-best finish since she took ninth place in 2015. This, despite the fact that she had very little training before the rally, suffering a bout of Q fever that kept her off her motorcycle for the entire season. Victory in the Quad category went to Nicolas Cavigliasso, who thoroughly dominated the event all through.